While Amazon won’t find a home in New York City, the tech giant’s founder just might. 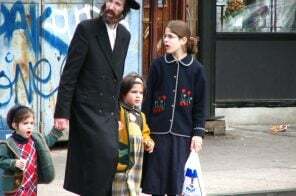 The New York Post reported on Friday that Jeff Bezos has been house hunting in the Big Apple following his recent divorce settlement. 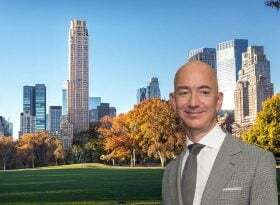 Bezos, currently the richest man in the world, checked out apartments at 220 Central Park South, where the most expensive home in the country recently sold. 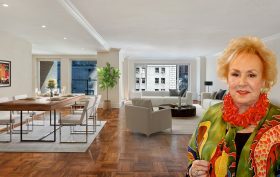 Back in 2017, 6sqft reported that the duplex co-op at 200 Central Park South owned by the late Emmy-winning actress Doris Roberts (you probably know her best as Marie Barone from “Everybody Loves Raymond”) had been listed for $3.3 million. Now the New York Post reports that the two-bedroom duplex has sold for $4 million. The sale included the two apartments owned by Roberts’ estate, plus an adjacent one-bedroom. The buyer, a Broadway producer, plans to combine the apartments into one big duplex within walking distance to the theater district. Extell Development’s supertall on Billionaires’ Row is officially the tallest residential tower in the world. As YIMBY reported this week, Central Park Tower, at 225 West 57th Street, has reached its 92nd floor, surpassing the 1,396-foot-tall tower at 432 Park Avenue. 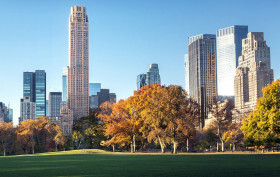 Designed by Adrian Smith + Gordon Gill Architecture, Central Park Tower will top out at 95 stories, or 1,550 feet tall, making it stand out significantly among neighboring skyscrapers when construction wraps up next year. President Donald Trump this month sold a $2.9 million condo at his Central Park South building to an unknown buyer, Forbes reported Tuesday. 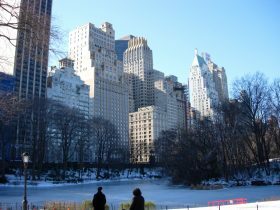 According to public documents, the deal between the Trump Organization and an entity called Koctagon LLC occurred on March 8 for an apartment at Trump Parc East, an 79-unit building next to the south end of Central Park. A limited liability company, or LLC, is typically used to protect the identity of the buyer. Here’s a rare chance to glimpse inside the secretive interiors of 220 Central Park South, which have previously been kept completely private by developer Vornado Realty Trust (h/t NYP). This is the first rental listing to open up in one of New York’s most coveted addresses, where billionaire Ken Griffin closed on a penthouse for just shy of $240 million, setting the record for the most expensive home ever sold in the United States. For $59,000 a month, the 3,114-square-foot home comes with some of the best views in town–even from the bathroom! 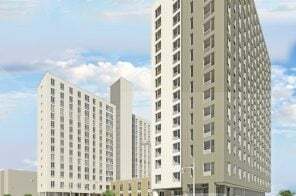 We’ve heard it before, but it’s always a shock to hear about how the city’s tax system undervalues big-ticket apartments in expensive neighborhoods. The Wall Street Journal reports that the effective tax rate on billionaire hedge funder Ken Griffin’s sky mansion at 220 Central Park South comes out to about 0.22 percent–compared with about one percent in the city’s less affluent neighborhoods. The reasoning behind this is tied to a complicated city property tax system that assesses all co-ops and condos as if they were rental properties. Rental income at nearby buildings is assessed in order to estimate a condo’s value. Progress images of 111 W57th Street; photo © Paul Clemence. Even before reaching its final height of 1,428 feet tall, SHoP Architect’s Midtown supertall 111 West 57th Street, which surpassed 1,000 feet a few months ago, wowed us with views from the tower’s 64th, 72nd, and 73rd floors. Upon completion, the Billionaires’ Row tower will become the tallest residential building in the world, taking the title from 1,396-foot 432 Park Avenue, (until 1,500-foot Central Park Tower tops out). 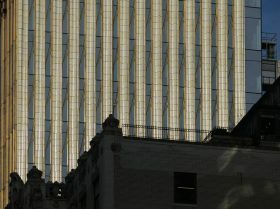 With a super slender frame (a ratio of 1:24), 111 West 57th Street is also set to become one of the skinniest skyscraper in the world. The new year brings new progress–and new photos showing the 86-story tower’s intricate terra cotta and bronze facade making its way skyward. Terracotta and bronze: going up! 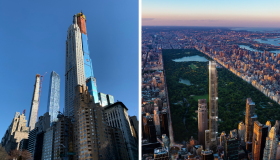 Billionaire Ken Griffin buys $240M NYC penthouse, the most expensive home sold in the U.S.
Update 1/29/19: The penthouse officially closed on January 23, 2019, for $239,958,219, more than was originally reported. 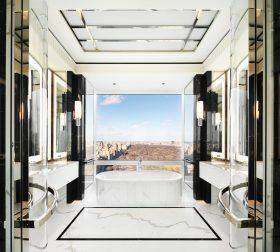 Billionaire Ken Griffin has closed on a penthouse at 220 Central Park South for $238 million, setting the record for the most expensive home ever sold in the United States, as the Wall Street Journal first reported. Griffin, who founded Citadel, first signed the contract to buy a 24,000-square-foot unit at the under-construction tower in 2015. The hedge fund mogul reportedly picked up the pricey digs as “a place to stay when he’s in town,” since his company is looking to expand its footprint in New York City. Gov. 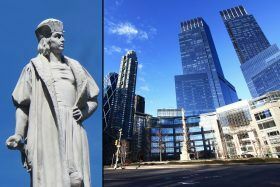 Andrew Cuomo announced yesterday that New York City’s Central Park-adjacent monument to Christopher Columbus has been listed on the State Register of Historic Places by the New York State Board for Historic Preservation. 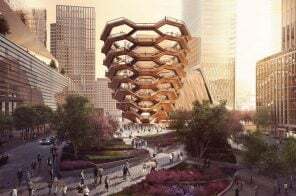 Cuomo also recommended the 76-foot rostral column statue, erected in 1892 by the city’s Italian-American community, for listing in the National Register of Historic Places. The statue was the subject of controversy earlier this year after violent white supremacist groups in Charlottesville, Virgina protested the city’s plan to remove a statue of Robert E. Lee. Mayor Bill De Blasio announced the statue would remain, following a 90-day review of the city’s monuments by a mayoral advisory commission. The race to build the tallest residential building in the world has long been underway along Billionaires’ Row, but 111 West 57th Street not only boasts height (at 1,428 feet it’ll surpass the current record holder, 1,396-foot 432 Park Avenue until the 1,500-foot Central Park Tower tops out) but a frame that is so slender (a ratio of 1:24) it garners it the title of skinniest skyscraper in the world. And after six years watching the development unfold, listings have finally gone live for the 46-unit condo, first spotted by Curbed. The first batch includes seven units, six of which are three-bedrooms ranging from $18 to $30 million, along with a $56 million penthouse.